I'm trying to reset my old beast of a computer to factory default - just a clean wipe of the entire thing, but I'm having some issues.. It's an Intel pentium 4, has the windows microsoft xp version 5.1 and in terms of the intel I believe it said intel ® GE v1.2.28 - I used to have no problem with just mashing F10 or whatever it was and clicking factory restore, but that feature doesn't seem to be there anymore. Help? I don't have any disks, cause they system came preloaded. I just want to wipe it clean so if I choose to sell it, no one has access to my old files. Any help would be greatly appreciated. If you need more info let me know. 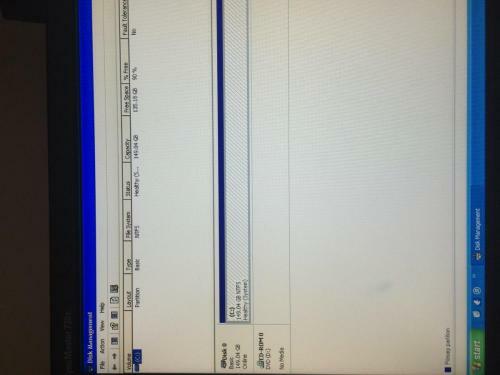 Can you take a screenshot of Disk Management showing the hard disk expanded? Click Start > Run> diskmgmt.msc expand the window to show all the blocks then take the picture and attach to the topic using the Attach Files option available by clicking on the More Reply Options button. Edit by paws: Sorry SleepyDude, I still haven't learned to type fast enough! If you don't have the Microsoft Install discs or system image discs then to perform a "restore to factory" your computer will have to have had preinstalled a Recovery Partition that when accessed by using the correct key combination will attempt to put the computer back to the state it was in when it left the factory. The information you have given us so far is useful but does not include the essential information that we need,,,, basically the name ( make) manufacturer of computer I.E. Dell, Toshiba Packard Bell, Compaq etc et... and as well as the make, we also need to know the exact model number and any numbers that are given. ( this is so we can access the data sheet or download the owners manual for the make and model concern to see if there was a recovery partition installed at the factory and the key combination to access it. If you take a look at disc management you should be able to see if there is a recovery partition but if in any doubt send us a screen dump or a photo of the relevant screen. 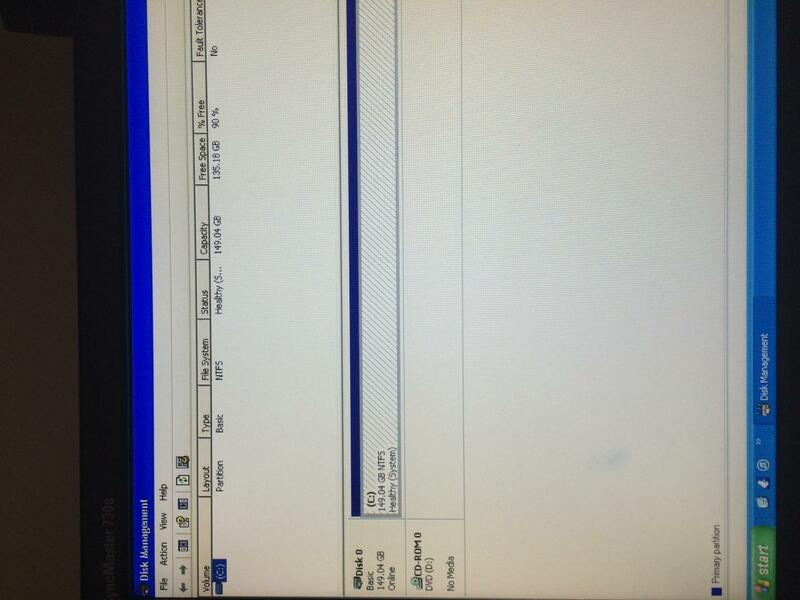 Its possible that if there was a recovery partition preinstalled someone may have subsequently deleted it....so that's why having a look at disc management is important. You mention" wiping the computer and "restoring to factory"..... unfortunately these are not the same thing! The "restore to factory" effectively clears parts or most of the computer's hard drive, so that the data and system files are no longer easily available and then a fresh image of the "factory state is written to the hard drive....... the original data is still there although it may have been overwritten, but is just difficult to access for ordinary folks, but possible for computer experts to do! To "wipe" the computer beyond most peoples ability to recover data from it, special destructive tools must be used, (see example link below) and if subsequently it is wished to re-install an operating system, then you will need the operating system installation discs or other installation media. Hey guys - probably not the greatest photo there but I had to take it with my phone, since the PC has limited mobility/no internet connection (using my mac right now). Anyways, in terms of wiping the system I just mean to basically get rid of the bulk of what's on there and reset her to factory - I doubt that too many comp. wizards are going to be looking to buy this old beast, if anything it'll probably end up in my sisters basement for her kids to game on - but I'd like to still reset her if I can. As for it's make/model - that might be a little more difficult for me to get. When I initially got the computer I had a friend who was good with this stuff build me one, so it's not any one make or brand specifically, so I don't know if there would be a specific model for it. All I have is the info I gave, unless there's a spot on the actual computer that details the schematics that you're looking for. If that IS the case, just let me know and I can go ahead and get those details. Cheers, and thanks in advance for the prompt help! Much appreciated here. There is only one partition on the disk so no Recovery! Do you have a folder c:\i386? Press and type c:\i386 the folder opens or you get an error? I get the error message "windows cannot find"
Ok, then the folder doesn't exist, it means that there is no way for you to recreate the Windows XP CD. On a machine with those specs you could eventually install Linux... Windows XP is a Operating System no longer supported by Microsoft and it's a risk to use specially if you connected it to the internet. Trying to restore my windows XP to factory settings.